Long time S ranker and tournament participant. I play all factions and playstyles, but do have my favorites. I like to help out when I can, so create budget decks, review replays, answer questions or just chat. Hit me up in game or on discord. Swarm Lilithe is a classic archetype and I think can be a fairy commonly popular one that people gravitate to. Some of the best swarm payoff cards are of a higher rarity, but the budget version is still pretty good and can perform admirably when it runs into an opponent with low AoE or draws well. There are some fantastic swarm players who have decks of their own design that you may wish to look at if you feel some cards I’ve oincluded aren’t pulling their weight, but I believe that my version should be able to get the job done. My experience playing the deck is that it has two main stages; building the swarm & cashing it in. In the first stage you want to try and preserve your minions whilst mostly keeping them close enough that they can threaten the enemy & interact (which can be a tricky balancing act). Once you’re at a critical mass and have a payoff card in hand it’s time to kamikaze your underlings in for big damage. The transition between these stages is one you don’t want to mistime or get wrong, wait too long and you can get blown out by AoE, go too early and you might not have enough to close out the game in the following turns. You can occasionally do a good balancing act and blur these stages together to play a seemingly more normal gameplan, but the deck will live or die how a player manages building their swarm and getting the biggest payoff from it. A match made in heaven, summon more wraiths and buff all your wraithlings. It can be good to time this on a turn when your BBS comes up anyway in order to get the 3/3 statline on all but the final 2 wraiths, but that’s by no means necessary. Furiosa is a great backline minion that your opponent will want to deal with just for the persistent threat it can pose, and cryptographer is a great way to get 3 minions on the board for 3 mana. Summon a bunch of Wraithlings. Swarm can be used to cleverly take mana tiles. Shadowstalk sometimes work quite well with Void Steal. Horn of the Forsaken is more of a slow drip wraithling generation and demnds you stay in melee range, but 1 mana for 3 wraithlings a pretty good deal. This card is a great way to preserve your swarm and benefit from their deaths too. It lets you make use of your payoff cards and keep your bodies on board for possible payoff next time. There’s actually a fair bit of importance in how you do your Bloodtide Priestess turn so that it’s the most protected, ideally fully surrounded so that any time a wraith dies around it it gets immediately replaced. If you pull this off this means it must be answered by spells/global reach effects. You can also place your general against the wall to make them part of this perfectly protected formation. These are the rest of the swarm payoff cards, mostly increasing the Attack values of your minions. For every active minion you have these cards get more damage. If you want to quickly calculate how much damage these will be adding then I suggest you learn your times tables. It is often okay to use a payoff card a little early if it looks like it will get decent value, you don’t have to kill them in one blow, but do be careful not to be left with nothing. The best way to learn is to use them and learn from any mistakes. A cheap and efficient unit that can contribute to your quick swarm generation, while also providing the utility of a ping which can be useful iin many situations. Ritual Banishing is another possible option is you want harder removal, but in most cases getting the unit out of the way is a good enough for the deck as it looks to enact it’s strategy fairly quickly without too much concern for what the enemies win condition is. Craft Soul Grimwar & Deathfire Crescendo if going for a Hyperswarm payoff, or Wraithcrown and maybe Lady Locke is you want to play a slower swarm game. Bloodbound Mentor is good in either variation I feel. 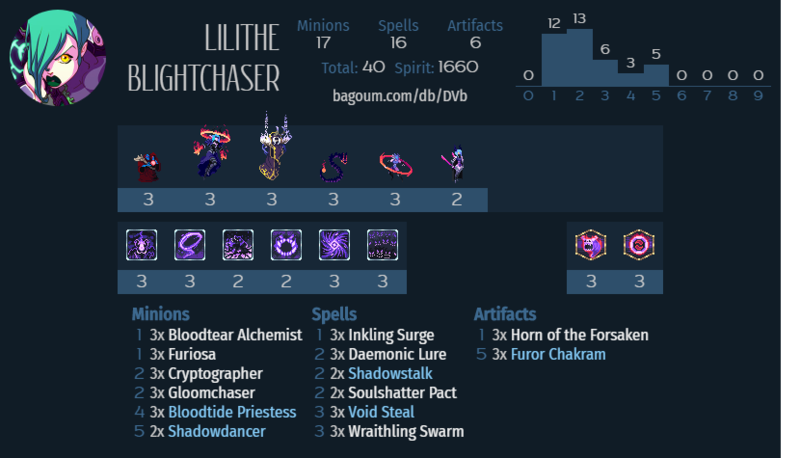 Wanderer Lilithe list piloted by FrostArrow in the playoffs of the Meltdown League. A midrange deck focused on staying alive long enough to craft a game-winning hand using Stygian Observer and Furor Chakram.